Download "Investec Bank plc. 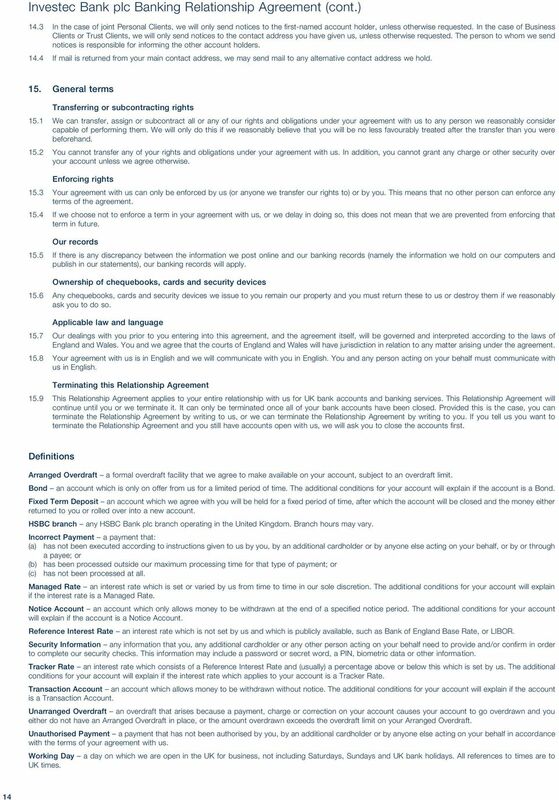 Banking Relationship Agreement"
4 Investec Bank plc Banking Relationship Agreement (cont.) If you change your mind about opening an account 1.16 In the case of Transaction Accounts, Notice Accounts and Bonds, you can cancel your account without charge within 14 days of the date your account is opened. If you wish to cancel, write to us at Investec Bank plc, Correspondence, FREEPOST LON9401, London EC2B 0ZZ (UK clients only) or Investec Bank plc, The Banking Team, 2 Gresham Street, London EC2V 7QP. We will return the deposit and any interest earned, or we will help you switch to another account if you wish If you do not cancel your account within the 14 day period, your account will remain open until it is closed under the terms that apply to your account. See condition 12 Closing accounts In the case of a Fixed Term Deposit, once you receive confirmation from us of the interest rate, when interest will be paid, the currency and amount of the deposit and the deposit term, you will not be able to cancel your account. Your personal information 1.19 We take the security and confidentiality of your personal information very seriously and we have various safeguards in place which are intended to protect that information. 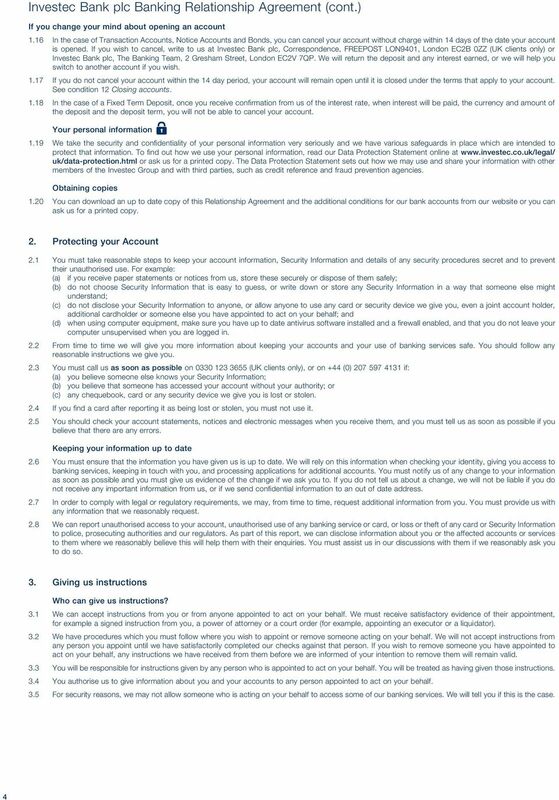 To find out how we use your personal information, read our Data Protection Statement online at uk/data-protection.html or ask us for a printed copy. The Data Protection Statement sets out how we may use and share your information with other members of the Investec Group and with third parties, such as credit reference and fraud prevention agencies. 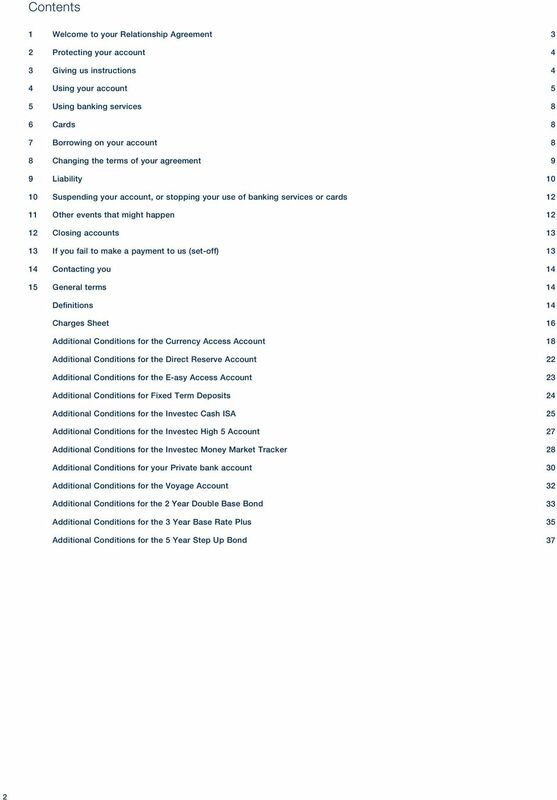 Obtaining copies 1.20 You can download an up to date copy of this Relationship Agreement and the additional conditions for our bank accounts from our website or you can ask us for a printed copy. 2. Protecting your Account 2.1 You must take reasonable steps to keep your account information, Security Information and details of any security procedures secret and to prevent their unauthorised use. For example: (a) if you receive paper statements or notices from us, store these securely or dispose of them safely; (b) do not choose Security Information that is easy to guess, or write down or store any Security Information in a way that someone else might understand; (c) do not disclose your Security Information to anyone, or allow anyone to use any card or security device we give you, even a joint account holder, additional cardholder or someone else you have appointed to act on your behalf; and (d) when using computer equipment, make sure you have up to date antivirus software installed and a firewall enabled, and that you do not leave your computer unsupervised when you are logged in. 2.2 From time to time we will give you more information about keeping your accounts and your use of banking services safe. You should follow any reasonable instructions we give you. 2.3 You must call us as soon as possible on (UK clients only), or on +44 (0) if: (a) you believe someone else knows your Security Information; (b) you believe that someone has accessed your account without your authority; or (c) any chequebook, card or any security device we give you is lost or stolen. 2.4 If you find a card after reporting it as being lost or stolen, you must not use it. 2.5 You should check your account statements, notices and electronic messages when you receive them, and you must tell us as soon as possible if you believe that there are any errors. Keeping your information up to date 2.6 You must ensure that the information you have given us is up to date. We will rely on this information when checking your identity, giving you access to banking services, keeping in touch with you, and processing applications for additional accounts. You must notify us of any change to your information as soon as possible and you must give us evidence of the change if we ask you to. If you do not tell us about a change, we will not be liable if you do not receive any important information from us, or if we send confidential information to an out of date address. 2.7 In order to comply with legal or regulatory requirements, we may, from time to time, request additional information from you. You must provide us with any information that we reasonably request. 2.8 We can report unauthorised access to your account, unauthorised use of any banking service or card, or loss or theft of any card or Security Information to police, prosecuting authorities and our regulators. As part of this report, we can disclose information about you or the affected accounts or services to them where we reasonably believe this will help them with their enquiries. You must assist us in our discussions with them if we reasonably ask you to do so. 3. Giving us instructions Who can give us instructions? We can accept instructions from you or from anyone appointed to act on your behalf. We must receive satisfactory evidence of their appointment, for example a signed instruction from you, a power of attorney or a court order (for example, appointing an executor or a liquidator). 3.2 We have procedures which you must follow where you wish to appoint or remove someone acting on your behalf. We will not accept instructions from any person you appoint until we have satisfactorily completed our checks against that person. If you wish to remove someone you have appointed to act on your behalf, any instructions we have received from them before we are informed of your intention to remove them will remain valid. 3.3 You will be responsible for instructions given by any person who is appointed to act on your behalf. You will be treated as having given those instructions. 3.4 You authorise us to give information about you and your accounts to any person appointed to act on your behalf. 3.5 For security reasons, we may not allow someone who is acting on your behalf to access some of our banking services. We will tell you if this is the case. 8 Investec Bank plc Banking Relationship Agreement (cont.) Card payments 4.20 If you use a card to withdraw cash or to make a payment, we will take the amount withdrawn or paid from your account on the day we receive details of the withdrawal or payment. Can you cancel a payment instruction? 4.21 Once we have received your instruction, you cannot cancel it. 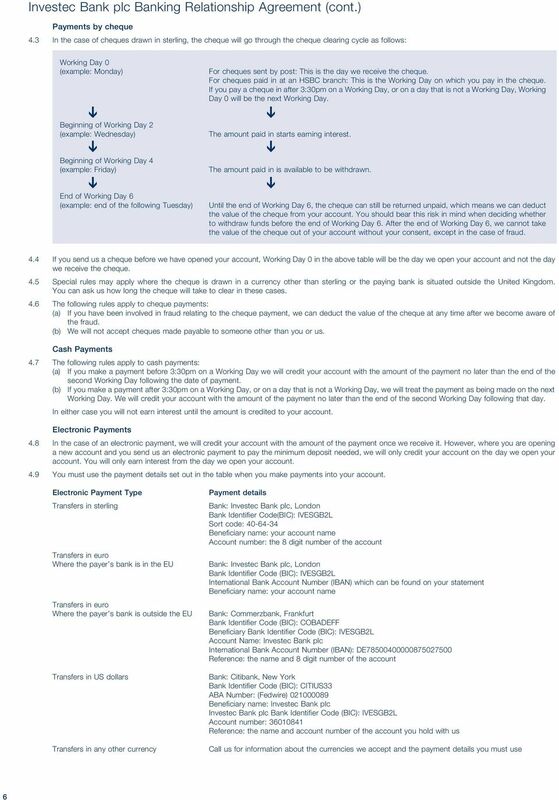 In the case of a future-dated payment instruction such as a direct debit or standing order, however, you can cancel your instruction at any time before 5:30pm on the Working Day preceding the day on which the payment is due to be made. In the case of a withdrawal instruction on a Notice Account, you can cancel your instruction at any time before 4:30pm on the Working Day preceding the day on which the payment is due to be made If the payee agrees to refund a card payment, we will credit the refund to your account when we receive it You can stop a cheque by writing to us or calling us and giving us full details of the cheque. You cannot stop a cheque after we receive it. Payments in another currency 4.24 If you make a payment out of your account (other than a card payment) in a currency which is not in the currency of your account, we will convert the amount using the exchange rate we select at the time we make the conversion. If you want us to confirm the exchange rate before we process the payment, tell us when you instruct the payment. Likewise, if you receive a payment into your account in a currency which is not in the currency of your account, we will convert the amount into the currency of the account using the exchange rate we select at the time we make the conversion. You can call us to find out what rate we apply We do not make or allow electronic payments in all currencies, and we do not allow cheque payments in all currencies. Contact us for details of the currencies we accept If you use a card to withdraw cash in a different currency, the exchange rate will be the rate selected by Visa, by the bank issuing the cash, or by the ATM operator, plus our currency conversion fee. We will tell you what our currency fee is in the additional conditions for your account. The amount will be converted at the time of the withdrawal and the exchange rate and the amount of the withdrawal after the currency conversion will be shown in your next monthly statement If you use a card to make a payment in a different currency, the exchange rate will be the rate selected by Visa plus our currency conversion fee. Visa s exchange rates can be found on the Visa Europe website. We will tell you what our currency fee is in the additional conditions for your account. The amount will be converted on the day the payment is processed by Visa. The exchange rate and the amount of the transaction after the currency conversion will be shown in your next monthly statement. Interest 4.28 We will tell you about interest rates in the additional conditions for your account. You can get details of our current interest rates on our website or by contacting us. Tax 4.29 We will pay interest after deducting income tax at the basic rate in accordance with UK law unless the account is tax-free, or we hold evidence which enables us to pay interest without deduction. Higher rate tax payers may have to pay additional tax. Statements 4.30 We will tell you about statements in the additional conditions for your account In the case of joint Personal Clients, we will only send a statement to the first-named account holder, unless otherwise requested. In the case of Business Clients or Trust Clients, we will only send statements to the contact address you have given us, unless otherwise requested. 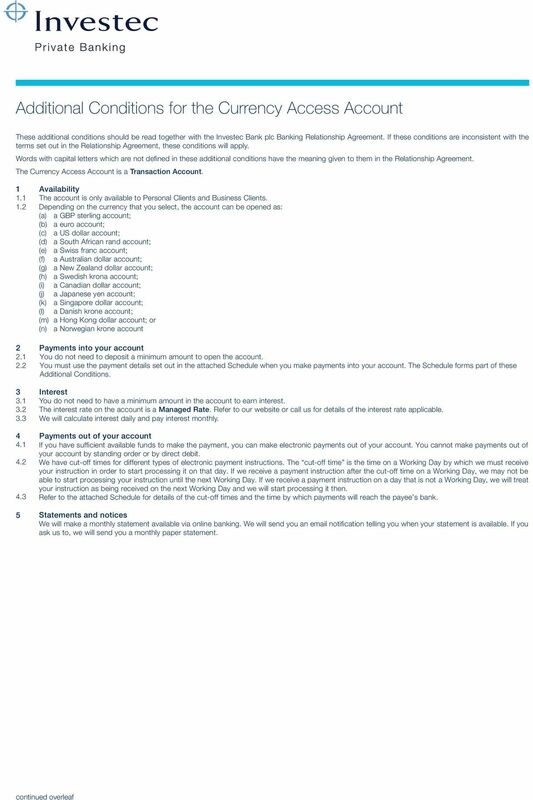 Charges and fees 4.32 Charges apply for some services and are set out in our charges sheet. 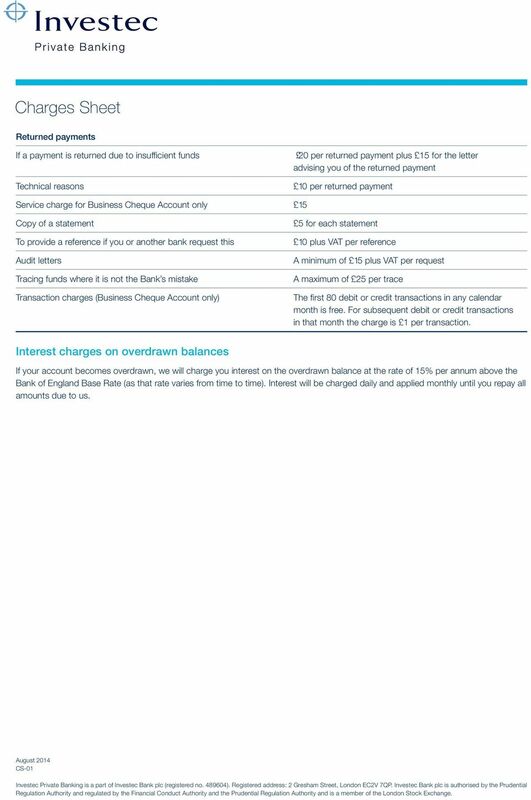 An up to date copy of our charges sheet is available on our website or on request. 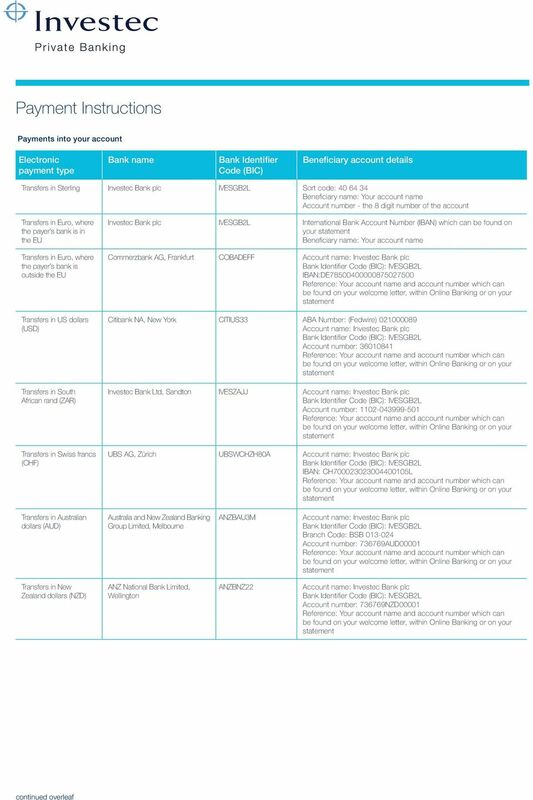 Where applicable, we will tell you about other charges or fees for your account in the additional conditions for that account If there is a payment into your account and a charge applies, we can debit the charge from the amount being paid in Other taxes or costs may exist that are not paid through us and are not imposed by us. You will be responsible for paying these. 5. Using banking services 5.1 When you access our banking services you may use our software, which we will license to you so that you can use the service. You will not however acquire any right, title or interest in this software. You must not modify, adapt, reverse engineer or decompile any software we license to you. 5.2 Our banking services may be unavailable due to systems maintenance or updates. Where possible we will try to give you advance notice of unavailability. Banking services may also be inaccessible or slow from time to time due to circumstances beyond our control, such as heavy internet traffic or server problems. 5.3 Our online banking service uses a high level of encryption. Using online banking in other countries may be illegal for this reason. You should check that you are allowed to use online banking in the country you are in. 5.4 You must ensure that any device and software that you use to access banking services complies with any reasonable standards and requirements we set from time to time. Compatibility requirements are set out on our website. 6. Cards Obtaining your card 6.1 If we make a card available, we will send you the card when you open your account, or to replace a card that is lost, stolen or damaged, or on renewal of your card. We can decide not to renew or replace a card and we do not have to tell you the reason. 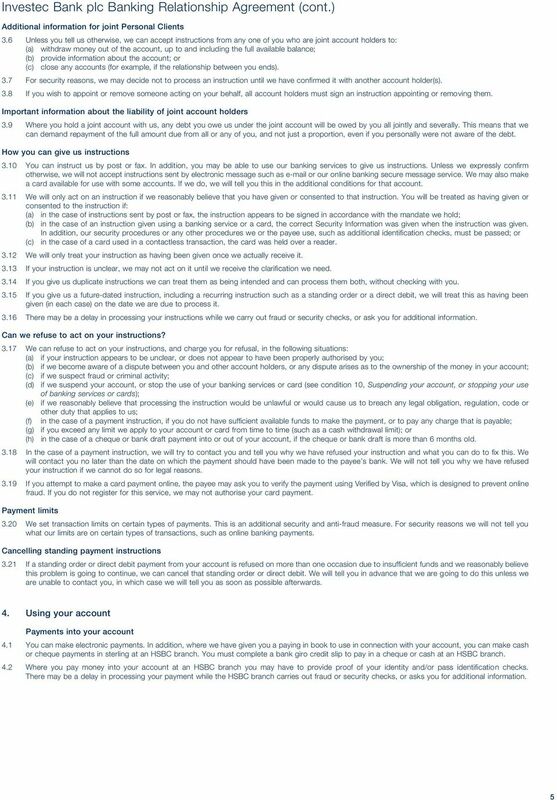 6.2 If the additional conditions for your account allow this, we may also send a card to an additional cardholder if you ask us to. Using your card You must not use your card for any unlawful purpose. You must not use a card after its expiry date, or if we have asked you to destroy it, or if we have told you that we have stopped its use. We can deduct the amount of any card payment (and any charges) from your account even if your card has been stopped by the time we make the deduction. 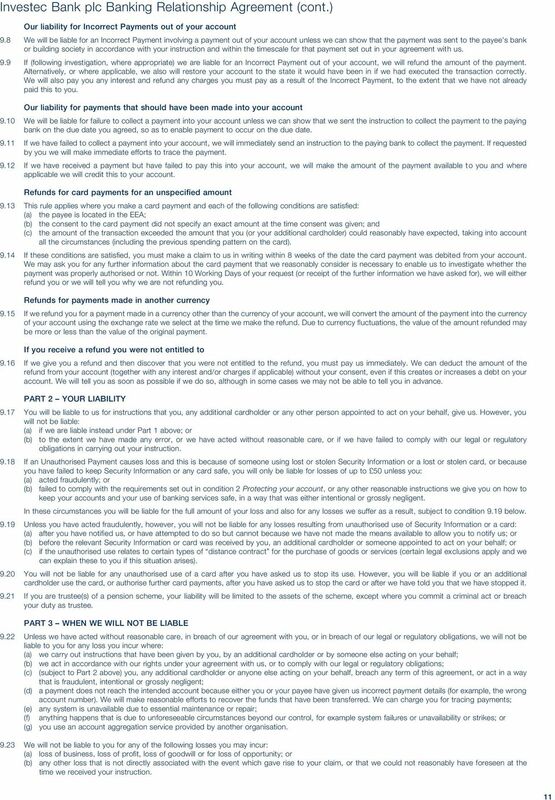 6.4 We will not be responsible if any payee or card machine does not accept your card, or if we refuse authorisation to a payee to accept payment by your card in accordance with the terms set out in this Relationship Agreement. 10 Investec Bank plc Banking Relationship Agreement (cont.) 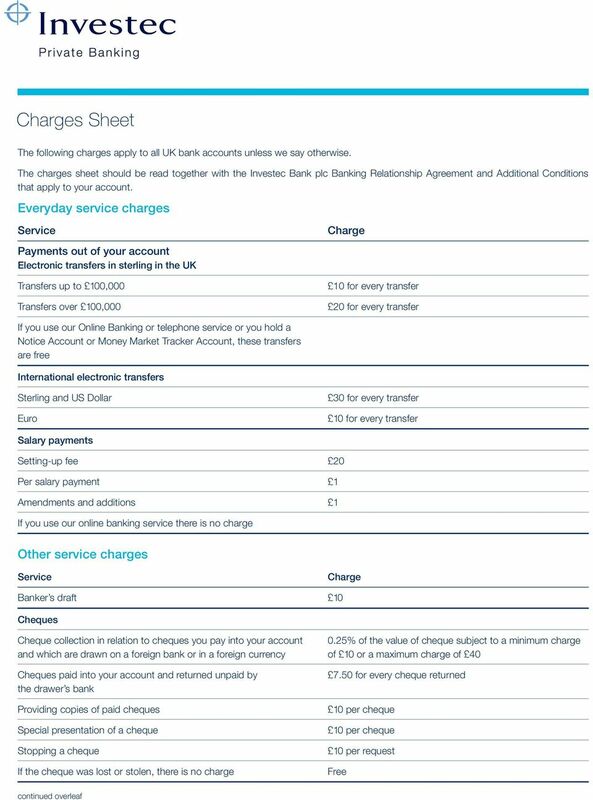 Changes to existing charges 8.7 We can introduce a new charge for an existing service, or increase or decrease an existing charge. We will only do this if we have a valid reason for doing so. 8.8 Where we introduce a new charge or increase an existing charge the following rules apply: (a) If your account is a Transaction Account, we will give you 60 days advance notice. If you do not accept the change, you can write to us during the notice period to close your account without loss of interest or paying any charges. If we do not hear from you, the change will take effect at the end of the notice period and you will be treated as having accepted the change. (b) If your account is not a Transaction Account, we will give you advance notice of the change in accordance with regulatory requirements. We will explain when the change will take effect. If the change adversely affects you, we will give you notice and you have the right, at any time up to 30 days from the date of our notice, to write to us instructing us to switch or close your account without loss of interest or paying any charges. 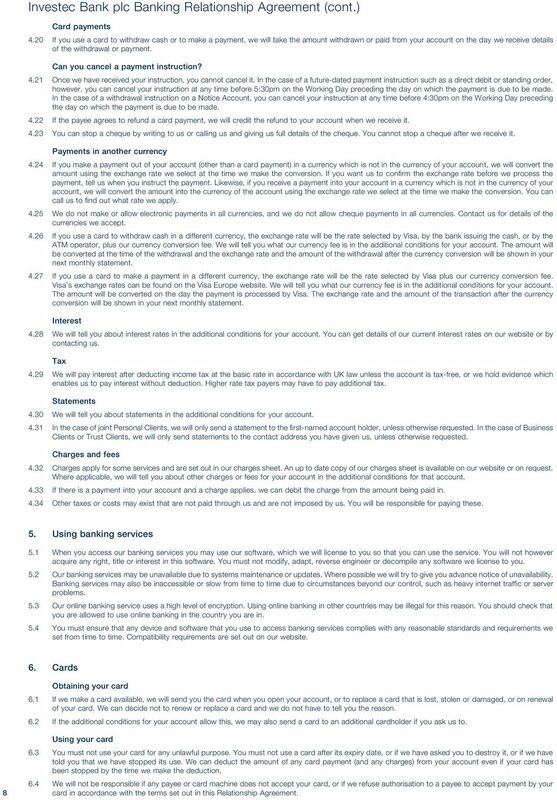 Changes to terms and conditions other than changes to interest rates or charges 8.9 We (a) (b) (c) (d) (e) can vary or amend any other term of the Agreement for any of the following reasons: to reflect proportionately other legitimate cost increases and reductions we incur in providing the account or our services; to respond proportionately to changes in Bank of England base rate, other market rates or tax rates; to reflect an actual or expected change in general banking practice, industry guidance or codes of practice, or market conditions; to comply with or anticipate changes in our legal or regulatory obligations; or to make our terms clearer or more favourable to you If your account is a Transaction Account and the change affects a term relating to how we process payments on your account, or liability for an Incorrect Payment or an Unauthorised Payment, we will give you 60 days advance notice. If you do not accept the change, you can write to us during the notice period to close your account without loss of interest or paying any charges. 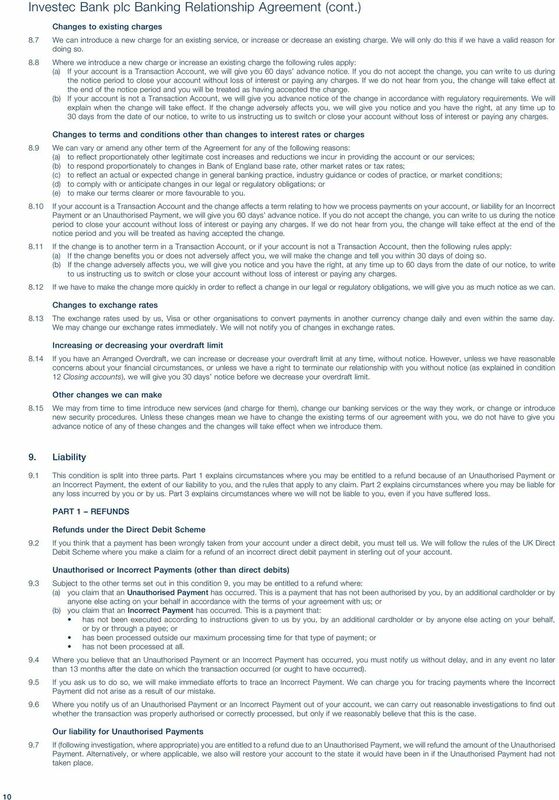 If we do not hear from you, the change will take effect at the end of the notice period and you will be treated as having accepted the change If the change is to another term in a Transaction Account, or if your account is not a Transaction Account, then the following rules apply: (a) If the change benefits you or does not adversely affect you, we will make the change and tell you within 30 days of doing so. (b) If the change adversely affects you, we will give you notice and you have the right, at any time up to 60 days from the date of our notice, to write to us instructing us to switch or close your account without loss of interest or paying any charges If we have to make the change more quickly in order to reflect a change in our legal or regulatory obligations, we will give you as much notice as we can. Changes to exchange rates 8.13 The exchange rates used by us, Visa or other organisations to convert payments in another currency change daily and even within the same day. We may change our exchange rates immediately. We will not notify you of changes in exchange rates. Increasing or decreasing your overdraft limit 8.14 If you have an Arranged Overdraft, we can increase or decrease your overdraft limit at any time, without notice. However, unless we have reasonable concerns about your financial circumstances, or unless we have a right to terminate our relationship with you without notice (as explained in condition 12 Closing accounts), we will give you 30 days notice before we decrease your overdraft limit. Other changes we can make 8.15 We may from time to time introduce new services (and charge for them), change our banking services or the way they work, or change or introduce new security procedures. 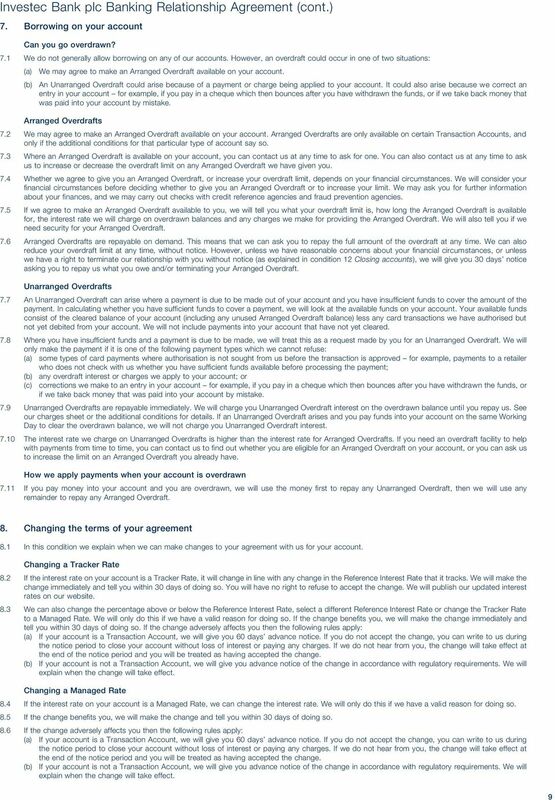 Unless these changes mean we have to change the existing terms of our agreement with you, we do not have to give you advance notice of any of these changes and the changes will take effect when we introduce them. 9. Liability 9.1 This condition is split into three parts. Part 1 explains circumstances where you may be entitled to a refund because of an Unauthorised Payment or an Incorrect Payment, the extent of our liability to you, and the rules that apply to any claim. Part 2 explains circumstances where you may be liable for any loss incurred by you or by us. Part 3 explains circumstances where we will not be liable to you, even if you have suffered loss. PART 1 REFUNDS Refunds under the Direct Debit Scheme 9.2 If you think that a payment has been wrongly taken from your account under a direct debit, you must tell us. We will follow the rules of the UK Direct Debit Scheme where you make a claim for a refund of an incorrect direct debit payment in sterling out of your account. 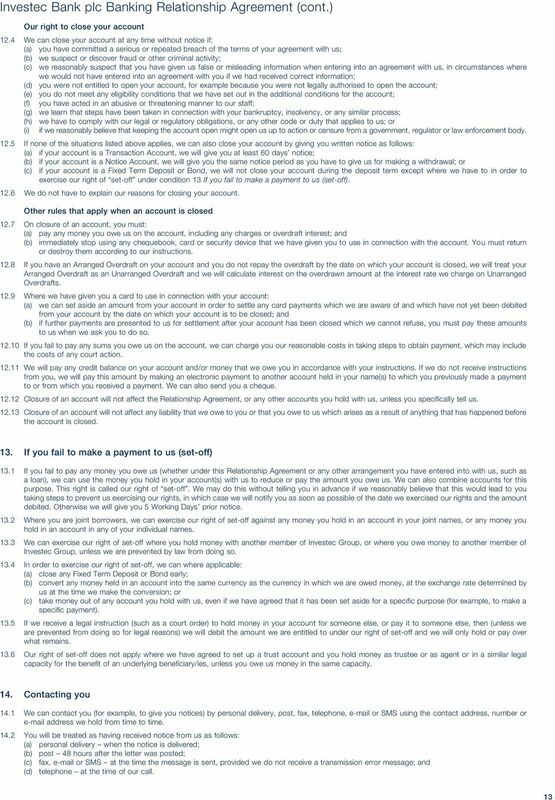 Unauthorised or Incorrect Payments (other than direct debits) 9.3 Subject to the other terms set out in this condition 9, you may be entitled to a refund where: (a) you claim that an Unauthorised Payment has occurred. 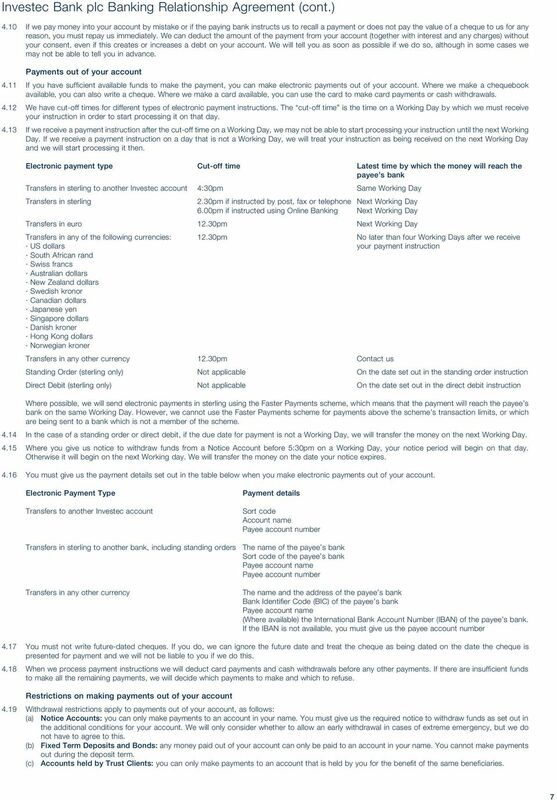 This is a payment that has not been authorised by you, by an additional cardholder or by anyone else acting on your behalf in accordance with the terms of your agreement with us; or (b) you claim that an Incorrect Payment has occurred. This is a payment that: has not been executed according to instructions given to us by you, by an additional cardholder or by anyone else acting on your behalf, or by or through a payee; or has been processed outside our maximum processing time for that type of payment; or has not been processed at all. 9.4 Where you believe that an Unauthorised Payment or an Incorrect Payment has occurred, you must notify us without delay, and in any event no later than 13 months after the date on which the transaction occurred (or ought to have occurred). 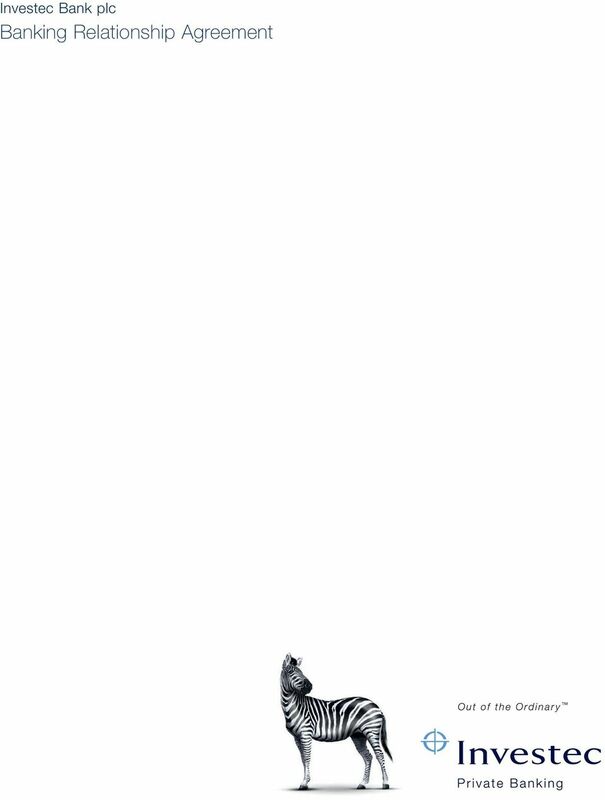 9.5 If you ask us to do so, we will make immediate efforts to trace an Incorrect Payment. We can charge you for tracing payments where the Incorrect Payment did not arise as a result of our mistake. 9.6 Where you notify us of an Unauthorised Payment or an Incorrect Payment out of your account, we can carry out reasonable investigations to find out whether the transaction was properly authorised or correctly processed, but only if we reasonably believe that this is the case. Our liability for Unauthorised Payments If (following investigation, where appropriate) you are entitled to a refund due to an Unauthorised Payment, we will refund the amount of the Unauthorised Payment. Alternatively, or where applicable, we also will restore your account to the state it would have been in if the Unauthorised Payment had not taken place. 12 Investec Bank plc Banking Relationship Agreement (cont.) 10. 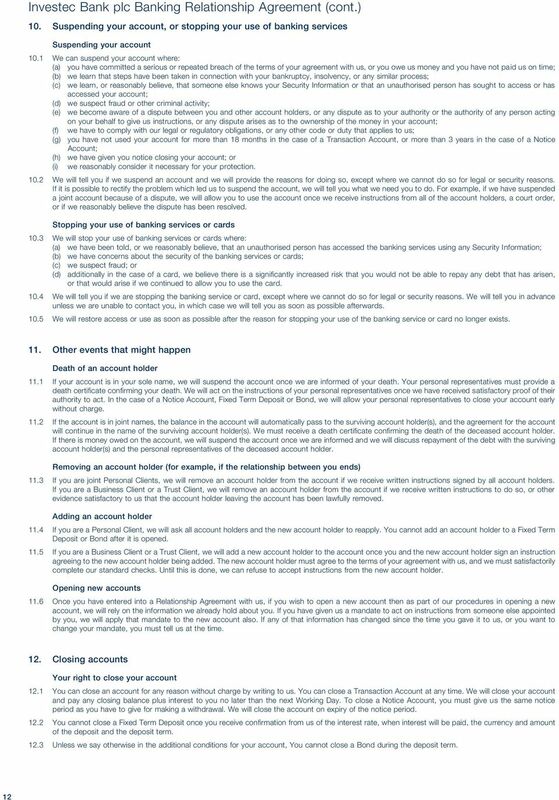 Suspending your account, or stopping your use of banking services Suspending your account 10.1 We (a) (b) (c) (d) (e) (f) (g) (h) (i) 10.2 can suspend your account where: you have committed a serious or repeated breach of the terms of your agreement with us, or you owe us money and you have not paid us on time; we learn that steps have been taken in connection with your bankruptcy, insolvency, or any similar process; we learn, or reasonably believe, that someone else knows your Security Information or that an unauthorised person has sought to access or has accessed your account; we suspect fraud or other criminal activity; we become aware of a dispute between you and other account holders, or any dispute as to your authority or the authority of any person acting on your behalf to give us instructions, or any dispute arises as to the ownership of the money in your account; we have to comply with our legal or regulatory obligations, or any other code or duty that applies to us; you have not used your account for more than 18 months in the case of a Transaction Account, or more than 3 years in the case of a Notice Account; we have given you notice closing your account; or we reasonably consider it necessary for your protection. We will tell you if we suspend an account and we will provide the reasons for doing so, except where we cannot do so for legal or security reasons. If it is possible to rectify the problem which led us to suspend the account, we will tell you what we need you to do. For example, if we have suspended a joint account because of a dispute, we will allow you to use the account once we receive instructions from all of the account holders, a court order, or if we reasonably believe the dispute has been resolved. Stopping your use of banking services or cards 10.3 We (a) (b) (c) (d) will stop your use of banking services or cards where: we have been told, or we reasonably believe, that an unauthorised person has accessed the banking services using any Security Information; we have concerns about the security of the banking services or cards; we suspect fraud; or additionally in the case of a card, we believe there is a significantly increased risk that you would not be able to repay any debt that has arisen, or that would arise if we continued to allow you to use the card We will tell you if we are stopping the banking service or card, except where we cannot do so for legal or security reasons. We will tell you in advance unless we are unable to contact you, in which case we will tell you as soon as possible afterwards We will restore access or use as soon as possible after the reason for stopping your use of the banking service or card no longer exists. 11. Other events that might happen Death of an account holder 11.1 If your account is in your sole name, we will suspend the account once we are informed of your death. Your personal representatives must provide a death certificate confirming your death. We will act on the instructions of your personal representatives once we have received satisfactory proof of their authority to act. In the case of a Notice Account, Fixed Term Deposit or Bond, we will allow your personal representatives to close your account early without charge If the account is in joint names, the balance in the account will automatically pass to the surviving account holder(s), and the agreement for the account will continue in the name of the surviving account holder(s). We must receive a death certificate confirming the death of the deceased account holder. If there is money owed on the account, we will suspend the account once we are informed and we will discuss repayment of the debt with the surviving account holder(s) and the personal representatives of the deceased account holder. Removing an account holder (for example, if the relationship between you ends) 11.3 If you are joint Personal Clients, we will remove an account holder from the account if we receive written instructions signed by all account holders. If you are a Business Client or a Trust Client, we will remove an account holder from the account if we receive written instructions to do so, or other evidence satisfactory to us that the account holder leaving the account has been lawfully removed. Adding an account holder 11.4 If you are a Personal Client, we will ask all account holders and the new account holder to reapply. You cannot add an account holder to a Fixed Term Deposit or Bond after it is opened If you are a Business Client or a Trust Client, we will add a new account holder to the account once you and the new account holder sign an instruction agreeing to the new account holder being added. The new account holder must agree to the terms of your agreement with us, and we must satisfactorily complete our standard checks. Until this is done, we can refuse to accept instructions from the new account holder. Opening new accounts 11.6 Once you have entered into a Relationship Agreement with us, if you wish to open a new account then as part of our procedures in opening a new account, we will rely on the information we already hold about you. If you have given us a mandate to act on instructions from someone else appointed by you, we will apply that mandate to the new account also. If any of that information has changed since the time you gave it to us, or you want to change your mandate, you must tell us at the time. 12. Closing accounts Your right to close your account You can close an account for any reason without charge by writing to us. You can close a Transaction Account at any time. We will close your account and pay any closing balance plus interest to you no later than the next Working Day. To close a Notice Account, you must give us the same notice period as you have to give for making a withdrawal. We will close the account on expiry of the notice period You cannot close a Fixed Term Deposit once you receive confirmation from us of the interest rate, when interest will be paid, the currency and amount of the deposit and the deposit term Unless we say otherwise in the additional conditions for your account, You cannot close a Bond during the deposit term. 17 Charges Sheet Returned payments If a payment is returned due to insufficient funds 20 per returned payment plus 15 for the letter advising you of the returned payment Technical reasons 10 per returned payment Service charge for Business Cheque Account only 15 Copy of a statement 5 for each statement To provide a reference if you or another bank request this 10 plus VAT per reference Audit letters A minimum of 15 plus VAT per request Tracing funds where it is not the Bank s mistake A maximum of 25 per trace Transaction charges (Business Cheque Account only) The first 80 debit or credit transactions in any calendar month is free. For subsequent debit or credit transactions in that month the charge is 1 per transaction. Interest charges on overdrawn balances If your account becomes overdrawn, we will charge you interest on the overdrawn balance at the rate of 15% per annum above the Bank of England Base Rate (as that rate varies from time to time). Interest will be charged daily and applied monthly until you repay all amounts due to us. August 2014 CS-01 Investec Private Banking is a part of Investec Bank plc (registered no ). Registered address: 2 Gresham Street, London EC2V 7QP. Investec Bank plc is authorised by the Prudential Regulation Authority and regulated by the Financial Conduct Authority and the Prudential Regulation Authority and is a member of the London Stock Exchange. 1,000,000. Triodos Bank. 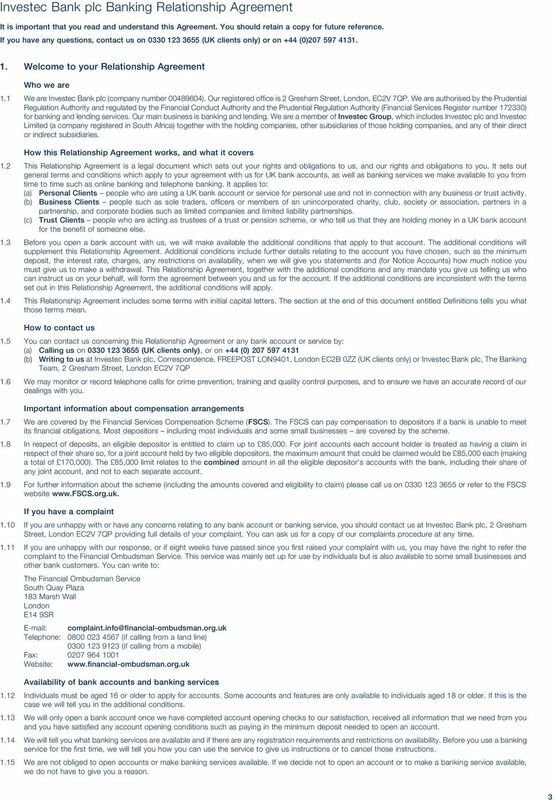 These are our Terms and Conditions for businesses and charities. 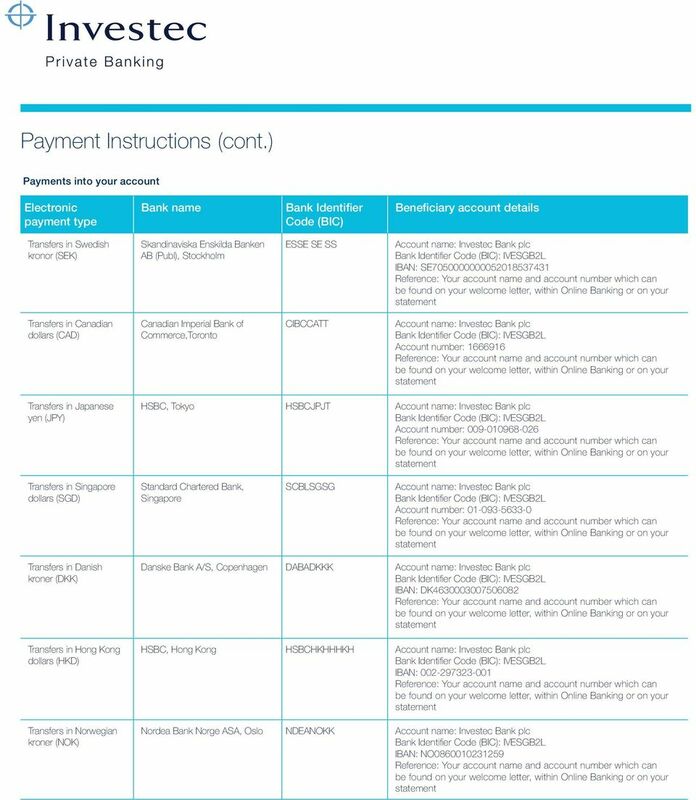 Savings & Current Account Terms & Conditions 1 These Conditions apply from 3 July 2015. These Conditions apply to all Cumberland savings and current accounts and explain the way in which your account works.